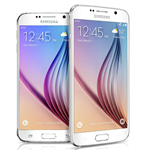 The Galaxy S6 is the hottest Android phone on the market right now, but it's not perfect. Some owners of this device have started reporting a bug that prevents them from dismissing a Samsung terms and conditions popup. Oh, it goes away at first, but then it takes over the screen again several minutes later. The popup is for the "Enhanced Features" component that includes Simple Sharing. 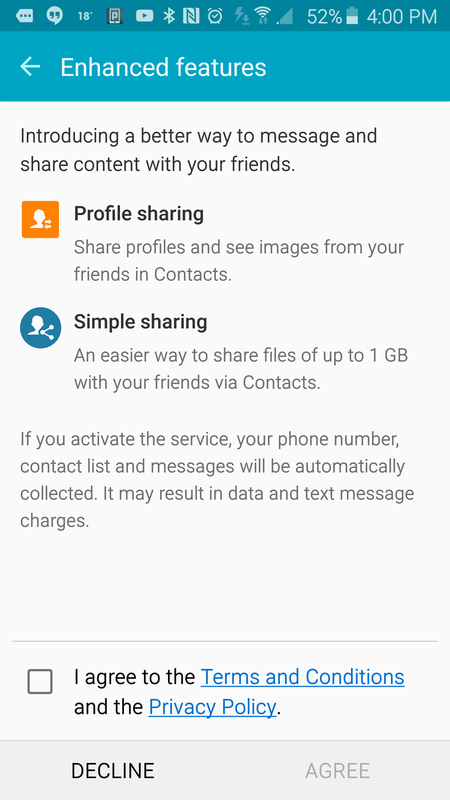 This feature lets you push large files and profile information to your contacts. A lot of people probably just agree the first time it appears, but the fine print is clear that agreeing means your phone number, messages, and contacts will be collected by Samsung. You would not be crazy to want no part of that. No matter how many times you tap "Decline," the popup keeps coming back. Not all the victims of this bug are saying exactly which version of the phone they have, but the most common seems to be T-Mobile GS6 Edge. At least one person says they're on the regular T-Mobile Galaxy S6, so maybe it's a T-Mobile thing. I should add, however, I have tested a T-Mobile GS6 and the bug is not present on that particular phone. So at the very least it's not universal. A few intrepid consumers have contacted Samsung to complain about the issue, but big surprise, the front-line customer service reps have no information. One device owner was (allegedly) told to just accept the terms. Whatever is going on here, it's something Samsung needs to address ASAP. There may be a way to get this screen to stop popping up, courtesy of +Robert Ray. 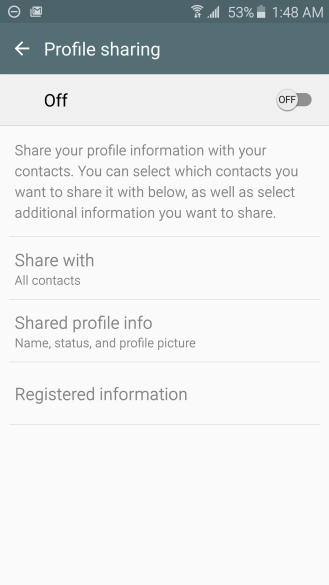 If you go into the Contacts app and open your own profile at the top, you can shut off profile sharing. Rather, you should be able to. On affected phones, the phone seems to hang trying to disable the feature. This might be the reason the dialog keeps reasserting itself. Below the toggle there should be a "Registered information" option (as seen above). 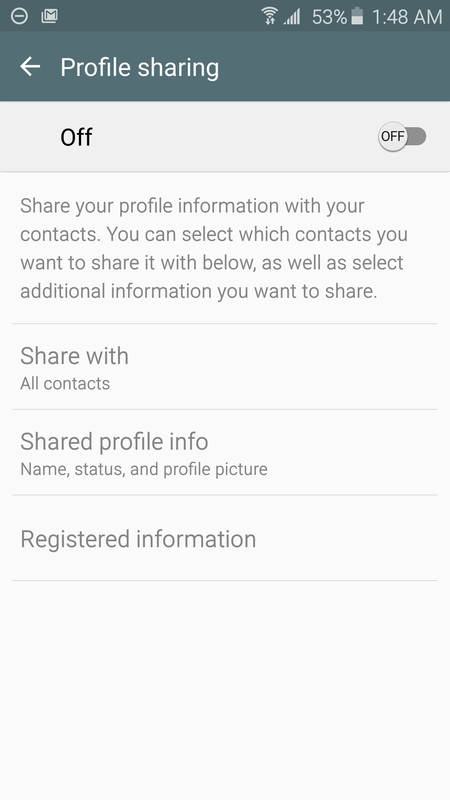 You can use this to deregister your number from profile sharing, which should stop the popups. The only GS6 I have on hand isn't suffering from this bug, so I can only say that these menus exist and it's probably worth fiddling around with them if you're having this issue.